Community meals happen organically when cooks and clean up folks join together in our well equip kitchen. Some of our best-shared meals are potlucks, BBQs and pizza night. Breakfast is a great kick off to workdays in the garden. Celebrating holidays, birthdays and festivities happen in our lovely dining room. With a large group of avid organic gardeners and others who enjoy working in our seasonal vegetable and fruit garden, we’re able to provide some produce for community meals and individual use. Our fruit trees include apples, figs, lemons, pears, persimmons, and plums. ​As a community we meet monthly to discuss issues, events, budget, and hear proposals from committees. Our decisions are made by consensus, allowing everyone to participate and be heard. The meetings are facilitated by members of our Facilitation Team. We also have committees that meet to divide up the work and share responsibilities. Coordinating Council meets to oversee the community and guide the next meeting agenda. We host weekend workshops for the community to discuss issues in more depth, learn and practice communication skills, get to know each other better, and have fun. We have monthly workdays. 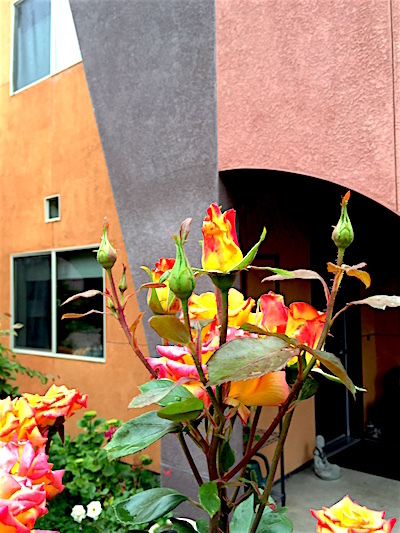 Together, we take on the maintenance and upkeep of the garden, landscaping, and buildings. We often kick off our workdays with breakfast and celebrate our success with root beer floats! 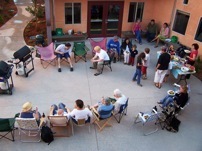 A Yulupa Cohousing value is to work on sustainability. To this end, we are avid recyclers, compost our vegetable food wastes and share resources. Stop for a chat with a neighbor, hang out with the kids, read a book in the courtyard or library, attend a movie night, or dine at a potluck barbeque. Various formal and informal classes have occurred in the Common House including meditation Spanish classes and crafts days.